Once we were approved to adopt Twilight’s Roadtrip, we had to come up with a new name as that one wasn’t going to work. We named him George Bailey from Jeff’s favorite movie of all time, It’s A Wonderful Life. And, being Christmas time, it seemed fitting. We named him George Bailey from Jeff’s favorite movie of all time, It’s A Wonderful Life. I took my Georgie B to as many meet and greets as I could, and one of them was the Holiday Expo at the Valparaiso Armory in 2002. That was the day I first met Bill and Karen Marshall, and that was the day that 2 dogs were returned in terrible shape. They were both so very pitiful it made Karen and I cry. So, that was also the day that I called Jeff and asked if he thought we could handle THREE dogs and if he was up to “foster” one of the returned dogs. We have laughed many times over the years as we have had as many as NINE greys at our house and that day we were wondering if we could handle THREE dogs. Well, I took the most pitiful of the two home with me. He was so weak that he tried to chase a cat out of our backyard and he couldn’t keep up. That faux foster took all of 20 minutes for him to weasel himself into being a permanent member of our family, and his name was changed to Harry Bailey, George’s brother in the movie. 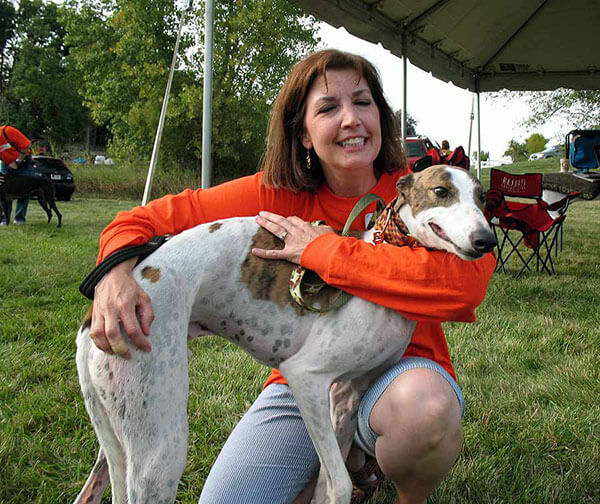 After we adopted Harry, we were asked to join the American Greyhound board, and we happily accepted. Our lives would be forever changed. As we got more and more involved, we decided to foster, and Zinger was our very first foster. Bill Marshall hand-picked Zinger for us to be an easy first foster and not scare us away. It worked, as Zinger was quite a special guy and we were hooked. There have been days that we have had 9 dogs and fed 40 cups of food a day, but there hasn’t been a single foster dog that hasn’t been deserving of being taken in by American Greyhound. Jeff and I have fostered 227 different dogs so far, and each and every one of them has been special and perfect in their own way. I take many pictures and scrapbook each one so I will never forget any of them. And, I sometimes pull my scrapbooks out and smile when I see their faces and read what I wrote about each one. Jeff and I have fostered 227 different dogs so far, and each and every one of them has been special and perfect in their own way. There are some that have been more challenging than others, and those stinkers seem to wiggle their way into my heart even more than you could ever imagine. I have had many sick dogs and cleaned diarrhea up off the walls, off the dogs crated next to them, off furniture and rugs, etc., and I wouldn’t have missed it for the world. When you read the horror stories about what still happens to the overflow dogs that no rescue groups can take, it haunts me to look into my dogs’ eyes and think that they could have easily been one of those dogs if no foster homes had been available. People ask me if it is hard to foster a dog and then let him or her go to their new forever home. And, yes it is, but it certainly beats the alternative of not having rescued that dog, fostered that dog, got to know that dog, taught that dog household rules and how to play with toys, loved that dog and then allowed another family to know the joy and love of that dog. Jeff and I have saved 227 very deserving souls who have given me so much more than I have ever given them.